Description: Cumberland. A map of the county from the second edition of Speed's seminal atlas, 'The Theatre of Great Britaine'. Showing a vignette of Carlisle and images of excavated Roman altars. 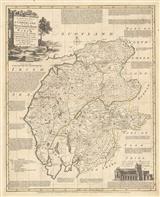 Description: Striking county map of Cumberland with inset plan of Carlisle and details and history of Hadrian's Wall. Coloured. Description: A beautiful coloured early map of the county of Cumberland embellished with a compass rose, an ornate cartouche and noting the Western part of Hadrian's Wall. Coloured. 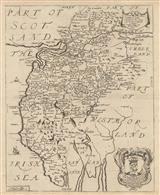 Description: County map of Cumberland based on the surveys of Speed and Saxton but printed at the time of Charles II. Description: Magnificient large copper-engraved map of Cumberland with panels of descriptive text about the towns and cities. Original colour. 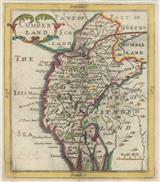 Description: A rich and detailed map of Cumberland and Westmoreland, taken from Bowen’s landmark survey of Georgian England. Original colour. Description: Cumberland. Miniature county map. Coloured. 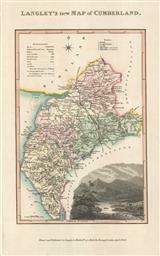 Description: Detailed county map of Cumberland. Original colour. 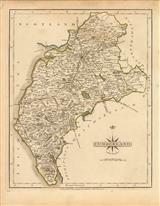 Description: Elegant and detailed county map with reference panel and list of the Wards. Original colour. 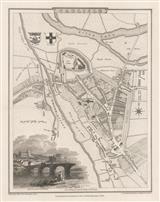 Description: City plan of Carlisle with a vignette of the town on the lower left. Description: Attractive map of Cumberland orientated East to West, highlighting the developing road network during the Industrial Revolution. Original hand colour. 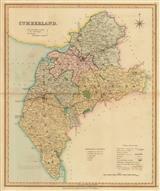 Description: Cumberland, divided into hundreds and covering the Lake District. Featuring elegant vignette of Upper Lake (Bassenthwaite Lake) with Skiddaw in the background. Original colour. 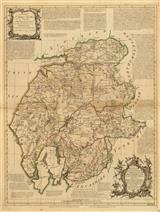 Description: Grand map of Cumberland with inset vignette of Carlisle Cathedral. Original colour. 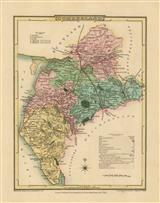 Description: Late Georgian county map of Cumberland with particular emphasis on mail coach routes as well as showing Turnpike Roads and canals. Original hand colour.